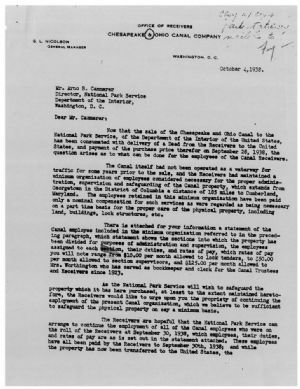 Now that the sale of the Chesapeake and Ohio Canal to the National Park Service, of the Department of the Interior of the United States, has been consumated with delivery of a Deed from the Receivers to the United States, and payment of the purchase price therefor on September 28, 1938, the question arises as to what can be done for the employees of the Canal Receivers. The Canal itself had not been operated as a waterway for traffic for some years prior to the sale, and the Receivers had maintained a minimum organization of employees considered necessary for the proper administration, supervision and safeguarding of the Canal property, which extends from Georgetown in the District of Columbia a distance of 185 miles to Cumberland, Maryland. The employees retained in this minimum organization have been paid only a nominal compensation for such services as were regarded as being necessary on a part time basis for the proper care of the physical property, including land, buildings, lock structures, etc. There is attached for your information a statement of the Canal employees. Included in the minimum organization referred to in the preceding paragraph, which statement shows the sections into which the property has been divided for purposes of administration and supervision, the employees assigned to each section, their duties, and rates of pay, which rates of pay you will note range from $10.00 per month allowed to lock tenders, to $50.00 per month allowed to section supervisors, and $125.00 per month allowed to Mrs. Worthington who has served as bookkeeper and clerk for the Canal Trustees and Receivers since 1923. As the National Park Service will wish to safeguard the property which it has here purchased, at least to the extent maintained heretofore, the Receivers would like to urge upon you the propriety of continuing the employment of the present Canal organization, which we believe to be sufficient to safeguard the physical property on say a minimum basis. The Receivers are hopeful that the National Park Service can arrange to continue the employment of all of the Canal employees who were on the roll of the Receivers at September 30, 1938, which employees, their duties, and rates of pay are as is set out in the statement attached. These employees have all been paid by the Receivers to September 30th, 1938; and while the property has now been transferred to the United States, the Receivers have not discharged the employees, but have allowed them to continue at their present duties in the hope that the National Park Service would be able to arrange to continue their employment and assume the payroll beginning October 1, 1936. Mr. Nicolson is a competent engineer, and is a life member of the American Society of Civil Engineers. He has designed and built many of the existing Canal structures, and is intimately acquainted with every detail of the property. While he does not desire employment on a full time basis, he would be willing to serve in a consulting capacity to those whoa you may place in charge of the development of the property, at such rate of compensation as would be in line with the services to be performed. Believing that you would find his services extremely useful in this connection, the Receivers are hopeful that some opportunity may be found to enable Mr. Nicolson to continue to serve the Canal, of which property he has been the Chief Engineer and General Manager since 1891. Encl Statement of Canal Employees. Suggested organization of existing employees, to be taken over from the Canal Receivers, for purposes of administration, supervision and the safeguarding of the Canal Property. Mrs. Worthington has kept the accounts of the Canal Trustees during this 15 year period, has sent out monthly bills to tenants, made collections, prepared vouchers etc. Handwritten at the top "copy w/ [?] park stationary mailed to [?]"